The liberals in Europe are trying to stop the so-called Alt right movement in its tracks, but all their attempts will be in vain. The people are sick of being told what to do, what to eat, how to dress up and how they should kiss up to violent radical Islamists. The liberals reasoning is that love will change these beasts into decent beings; they are living on another plant and moved from reality. The only thing that can change the way these animals think is to address fire is with fire. An eye for a face policy needs to be implemented, where the punishment is so brutal and painful that they think 100 times before even thinking of committing an act of violence. There is nothing the liberals can do to stop this trend now. There is going to be a violent war in Europe as Europeans fight aggressively to take back their country. The good old days of turning the other cheek are over; now it’s going to be the boot that most radical Islamists will be dealing with. 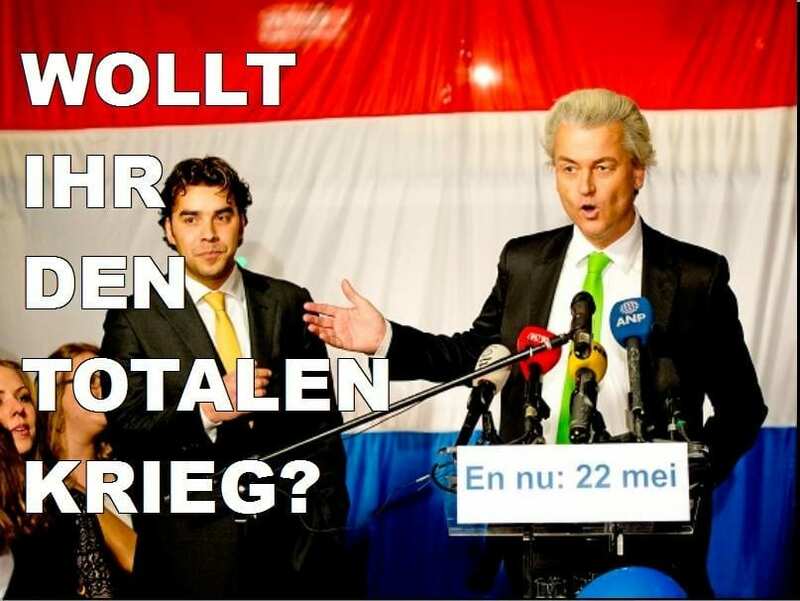 Wilders’ far-right Freedom Party (PVV) has gained significantly in the polls since his conviction. If the elections were held today, a national poll finds that PVV would win 36 out of 150 seats in the lower house of parliament, making it the biggest single political group. It currently has 12 seats. Wilder’s was convicted in November, and the story below is about five days old. If something like this had occurred in the past, it would have been the end of this chaps political career, but instead of losing momentum he has gained ground, clearly proving that a trend in motion is unstoppable. The next set of European leaders are going to follow the lead of the Hungarian prime minister, Putin and Trump. They will speak their minds out and fight fiercely (sometimes a bit too aggressively) for the rights of Europeans. Radicals are going to be targeted brutally and sadly as always the innocent will be caught in the crossfire. Everything is connected you just need to spot the pattern. Free market forces ceased to exist after 2008; the markets were never free, but any remnants of freedom vanished after the Fed decided to prop the markets indefinitely by forcefully maintaining an ultra-low rate interest rate environment. All the information today is manipulated; from the food, you eat to data you are provided. If you are aware of this, you can plan accordingly. Identifying the problem is over 80% of the solution, and this is why most people do not know what to do because they do not understand the problem. Now you know why we are the only financial website that covers such a wide array of topics that on the surface appear to be unrelated but are in fact, deeply interwoven. Mass psychology is a very powerful tool, and if employed correctly can help you spot the abnormal levels of manipulation, the masses are subjected to. We strongly recommend that you take a look at Plato’s allegory of the cave.